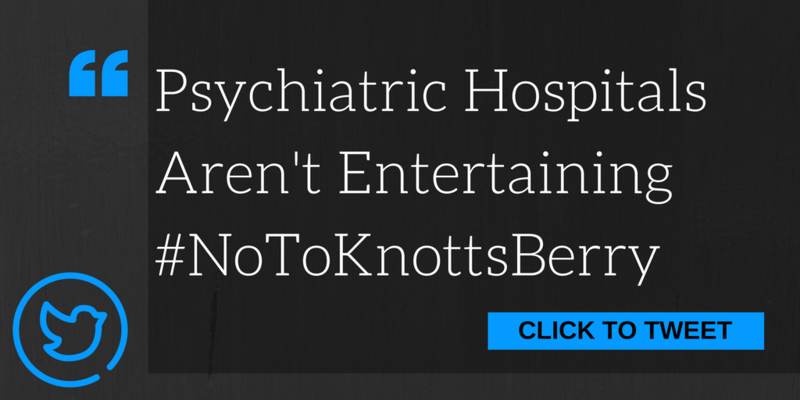 Knott’s Berry Farm in California has launched a psychiatric hospital-themed Halloween attraction at their theme park. Earlier this week, I was interviewed for an article by The Mighty and I will expand my response here. I like it so much, I think we should create another attraction next to this one and call it something like, “Birmingham: 1963”. It will only be available to white people. Participants can get a feel for what it would have been like in the 1950’s and 1960’s in the South. Ticketholders would get to have crosses burned in the front yard and bricks thrown through the window. Dogs will be unleashed on them as they are sprayed down with fire hoses on the sidewalk, too. No? Too offensive? Our African American brothers and sisters would be outraged at the very thought of it? On the other side, we’ll build an attraction called “Auschwitz”. Too offensive? We could make the name something a little more catchy. We’ll call it “Concentration”. Adults and children can be starved for a day, walk into a room called “the showers”, and get a glimpse of what it would be like to be gassed. It would receive national attention because our Jewish neighbors would find it unthinkable? Shocking. 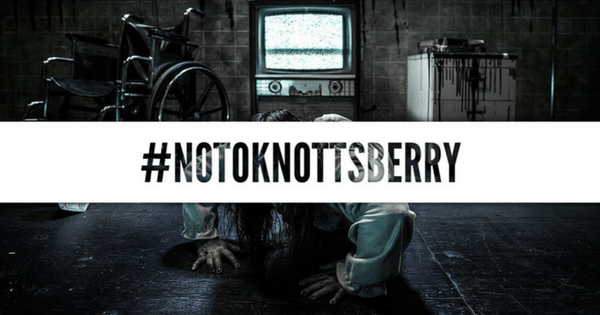 Since Knott’s Berry Farm is in California, maybe we should create an attraction that’s a little closer to home. We could call it “Prop 66: Kill ‘Em All”. The attraction would simulate the countless men and women on Death Row who are isolated, devalued, and degraded as human beings. The attraction would have no windows, just to give you a glimpse of what it would be like to not see the light of day for years on end. No showers. Inadequate medical care. No contact with loved ones, and you’d beg to get a decent meal for the day. Simulating execution would be awesome! Someone could strap you down in a chair, pump you full of electricity, and fry your body and your brain until you cease to exist. Lethal injection might be more humane, but who the hell wants that? THIS IS ENTERTAINMENT! Protesters would march just outside the attraction, screaming to shorten time between conviction and execution. You’d be spit on, shunned, and have trumped-up charges yelled in your face. The calendar would show the inadequate time for your appeal, and you’d know you have little chance to prove your innocence prior to a speedy execution. Is your blood pumping yet? Those who have seen a loved one falsely convicted because of false confessions wouldn’t find this attraction very attractive at all. If you were incensed by my idea about the Civil Rights Movement, The Holocaust, or Death Row, welcome to the world of mental health. If you’ve never been treated in-patient or institutionalized for any time, you have no idea what it’s like. And we certainly don’t think it’s fun or entertaining. The psych ward exists for ill people who are often in desperate need of help. If the creators of “Fear VR: 5150” would slow down long enough to realize these are actual lives we’re talking about, maybe they would reconsider hosting such a foul attraction. Psychiatric patients can tell you exactly what the end of the rope looks like because they have been there. If you wouldn’t create a an Auschwitz-themed attraction or one that replicates the struggle of blacks in the South sixty years ago, don’t create one that is supposed to mimic a psychiatric hospital. It’s ignorant, hurtful, and just plain stupid. To sign the petition to have this thoughtless attraction shut down, please join Change.org and make your opinion count.